In rottentomatoes, Sucker Punch, directed by Zack Snyder, had a very low acceptance during its first weekend, it seems to be that the film is a complete failure, its qualification is 20%, and Diary of a Wimpy Kid: Rodrick Rules (the sequel) is not so great either, but better with a 40% according the critics, and that is why it is at the first place in the top ten. Sucker Punch: [Action, 2 hrs. 00 min.] Emily Browning, Abbie Cornish, Jena Malone, Vanessa Hudgens, Jamie Chung, Oscar Isaac, Carla Gugino, Jon Hamm, Scott Glenn. 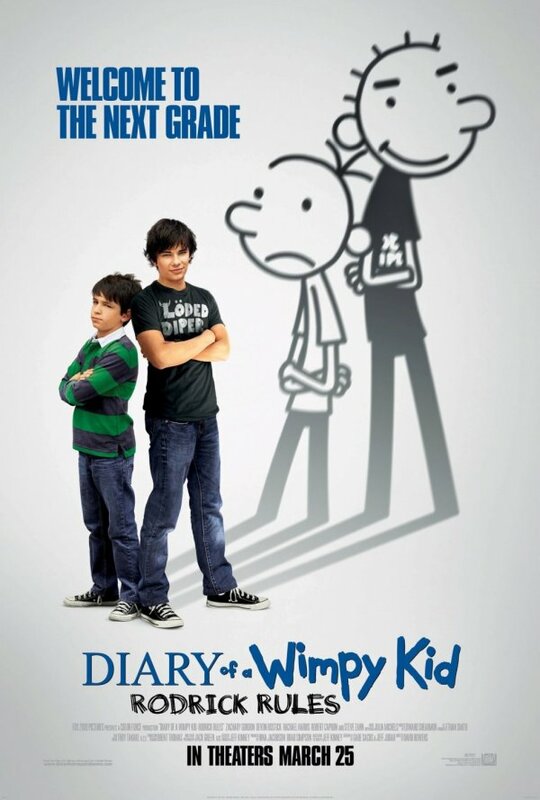 Diary of a Wimpy Kid: Rodrick Rules: [Comedy, 1 hr. 36 min.] Zachary Gordon, Devon Bostick, Rachael Harris, Steve Zahn. My husband and I went to see “Diary of a Wimpy Kid sequel – Rodrick Rules yesterday. Not knowing what to expect and not having read the New York Times best selling book series, we weren’t sure if we were even going to be entertained…. But WOW! Were we ENTERTAINED! This was a great movie. It is so Funny, Witty, Sharp, Paced Well and just an all around enjoyable, relatable film. The kid actors were excellent, especailly the star of the movie Zachary Gordon who played Greg Heffley. This kid can act and carry this movie well. He is adorable, lovable, smart beyond his years and fun to watch. The boy who played his older brother Rodrick (Devon Bostick) was also very good in his role. Seems like these 2 had great on screen chemistry so their must be a real respect between the 2 of them. It reminded me of “Ferris Buehlers Day off”. You feel so good at the end of the movie. It has all it’s important points laid out for you to experience and remember from your own childhood…and the movie is dead on regarding those points. This is not a contrived movie as so many others are. It’s just a strong, heartfelt, experience for movie goers. See this movie if you like top notch, good and funny entertainment!! !